With African tech hubs, startups and founders starting to mature and gain deeper understanding of local markets after a few years of heady hype that was more about potential than substance, investors increasingly look towards the continent. Partech Ventures’ latest annual funding report shows that venture capital funding in 2017 reached $560 million, recording 53% year on year growth. The scale of growth in funding is seen in the number of investment rounds participated in by startups: in 2017, 124 startups participated in 128 funding rounds compared to 77 rounds in 2016. Partech’s reports include startups that have a primary market in Africa whether or not they are headquartered or incorporated on the continent. Across sectors, financial inclusion accounted for 45% of total investment—more than any other sector—with $253 million raised. Partech’s report categorizes off-grid tech, fintech and insurance tech startups under financial inclusion. Over the past 18 months, African fintech startups have particularly grown in appeal and reputation with a number of big-ticket deals, most notably a $10 million Series A raise by payments company Flutterwave—one of the largest Series A rounds by an African startup. That appeal is linked to the upside for these startups who, rather than entirely disrupting the financial sector which currently exists, are plugging many of its gaps. An earlier funding report by Disrupt Africa also shows that fintech startups attracted nearly a third of startup funding in 2017. Online and mobile consumer services also drew significant interest pulling 42% of total investment ($236 million). The single largest deal in the report came in this sector with the $69 million Series D investment in TakeALot, the South African e-commerce startup, led by Naspers, Africa’s most valuable company. In line with previous years, South Africa, Kenya and Nigeria continue to dominate as investment destinations accounting for 76% of total funding this year, slightly lower than the 81% of last year’s total. Similarly, the three leading tech startup ecosystems lead the way with number of startups funded per country. 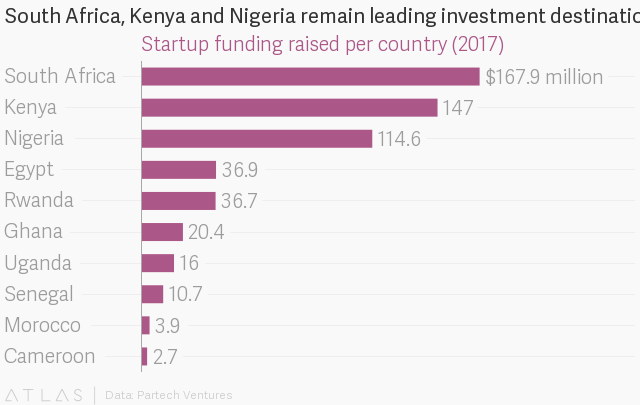 Startups in Francophone Africa have also seen more investment, accounting for $55.5 million—10% of the total funding, and nearly 14% of the total transactions in 2017. 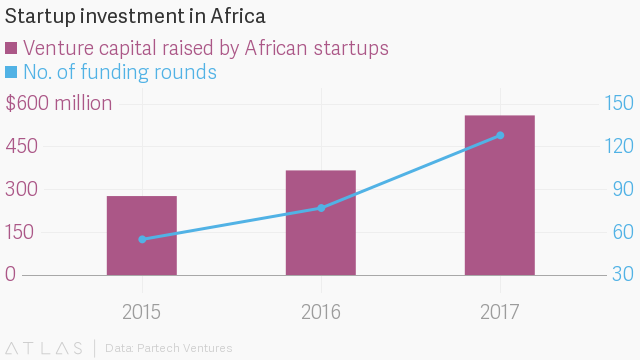 That progress seems set to continue as, last month, Partech Ventures has launched a pan-African fund based in Dakar, Senegal and plans to pay closer attention to startups in French-speaking countries.